Eli W. McKenney (Eli Wilson McKenney, sometimes spelled Eli W. McKinney), son of George Washington McKenney Sr. and an unknown woman, was born 1877 in Iowa. Half-brother of our George Washington McKenney Jr., he was career military and in the Philippine War of Independence/American-Philippines War. George W. McKenney’s first wife, Isabella, had died several years earlier and with her death he had boarded out, it seems, the younger of their surviving children, including my ancestor, George W. McKenney Jr. During that time afterward it appears George W. McKenney Sr. returned to Iowa and married again. We had no information on who the second wife was but I believe she was a Sarah F. Dotson (Dodson). Sarah F. Dotson was born about 1850-1854 in Davis County, Iowa. The 1856 Salt Creek, Davis, Iowa census shows her with siblings and mother, Eliza. Her mother remarried and in 1860 we find Sarah as “Sallie” in the household of her stepfather, Thomas Sumner. They are in Union, Appanoose, Iowa, but her brother, Albert, is also in the Salt Creek, Davis, Iowa census, 16, in the household of a John and Rachel Sconce, who are relatives. Prudence Lynch, daughter of a Delilah Jane Dotson and William Lynch, had married John Casper Sconce in 1848 in Davis. So, Albert is on pg. 748. On page 750 is a 16 year old George Breckinridge who will marry Lucy Etta Campbell in 1868. Lucy Etta Campbell was a sister of Marion Campbell who wed Martha Elizabeth McKenney, Eli’s half-sister, in 1867 in Wapello County, Iowa. In 1870 we find Sarah in the Village, Van Buren, Iowa census. George W. McKenney Sr. and his family had been living in Village in 1860 and still had relatives in Van Buren County. It may be that he met Sarah here after Isabella’s death. It may be that they had an acquaintance even before Isabella’s death. Then, in “Iowa, Marriages 1809-1992”, we find the marriage of a George W. McKenney and Sarah F. Dotson on 1875 Aug 22 in Davis County, Iowa. 1875 is the year that we find George W. McKenney’s children boarded out in Kansas, but George W. McKenney is no where to be found in the Kansas census. I had always assumed Eli’s mother had died. In 1880, George W. McKenney appears in Arkansas with his son Eli, and only gives himself as single rather than widowed. By Feb 1879 George W. McKenney had built a house in the Chautauqua Co. area and it appears that Sarah had moved to that county with the family after Eli’s birth, but they had separated by 1880 when she is found living as a servant in Sedan. Then in 1885 we find in Ottumwa, Wapello, Iowa, a divorced Sarah McKenney. This is tentative research, but I believe she is the same Sarah Dotson who married George W. McKenney in 1875 in Davis County, Iowa, and that she is the mother of Eli W.
On April 19, 1891, in Ottumwa, Wapello, Iowa, Sarah married a 2nd time to a Tom B. Hanna who was born about 1852 in Putnam County, Indiana, his parents being George R. Hanna and Mary Burgiss. Sarah gave herself as Sarah Dodson McKinney, born 1852, child of John Dotson and E. Stapleton. “Iowa, County Marriages, 1838-1934,” index, FamilySearch (https://familysearch.org/pal:/MM9.1.1/XJF3-BY7 : accessed 19 Dec 2013), T. B. Hanna and Sarah Dodson Mckinney, 1891. In 1900, Sarah and Tom are living in Union, Iowa. They had no children but she gives herself as having 1 child still living, which would have been Eli W. McKenney. Tom Hanna died before 1910, when we find Sarah living in Richland, Wapello, Iowa. In 1922 she was living at 328 S. Vinea, Iowa City, Ottumwa, Iowa, given as the widow of Thomas. In 1930 she was in the Wapello County Home and Insane Asylum in Highland, Wapello, Iowa. Now, back to Eli E. McKenney and what we know of his life with his father, George. 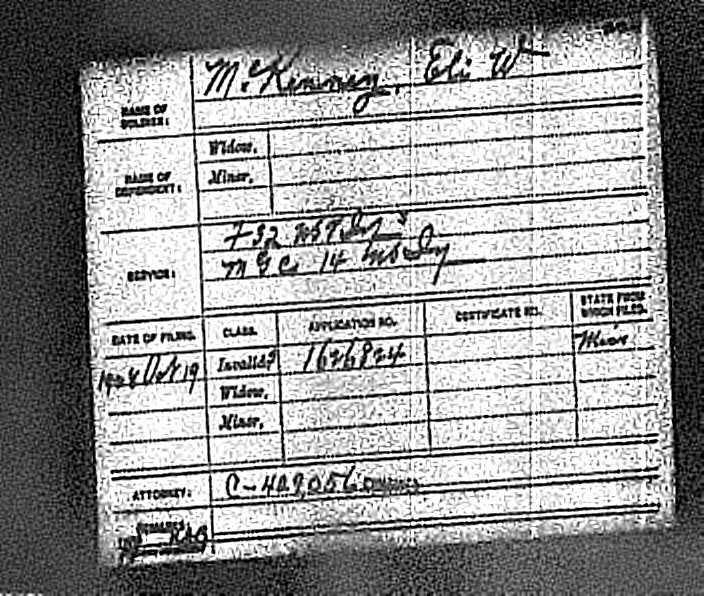 Eli W. McKenney was recorded in the family genealogy and my grandfather knew of him so I was aware of Eli before doing census research. After the death of Isabella, Addie and George W. Jr. were boarded out during the time George W. was remarrying up in Iowa and having son Eli with Sarah. In 1880 the McKenney family has reunited and is in Arkansas. George W. McKenney Sr. was a traveling carpenter and I assume he was there for work. He has with him his three youngest children, Addie, my George, and Eli. George W. McKenney Sr. was residing in Cedar Vale, Chautauqua, Kansas in 1884 and is in the census at Center, Chautauqua, Kansas in 1885, but he is only with his son George Jr. in 1885. His daughter Addie McKenney had by this time married Samuel Alvin McWhirt and I think it’s a good bet that Eli was living with Addie at Pawhuska on the Osage Reserve. January 16 1887 George W. McKenney Sr. married a third time. This marriage was to an Alice Tilson at Rogersville, Hawkins, Tennessee. They thereafter disappear into the Oklahoma Territory and I find nothing on him again until 1905 when he has returned to Kansas, without Alice, and is living in the household of his son George W. McKenney Jr. According to the 1930 census, Eli was married first at age 20, which would have been about 1897. I’ve no information on this, if there was a very early marriage. The 1900 census gives him as single. He is serving in the Philippines. His home is given as being in Pawhuska which is where his half-sister Addie was living. 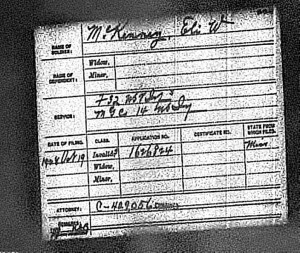 McKenney, Eli W. Private, Pawhuska, OK., white male June 1877 23 single, Born Iowa, father born Ohio and mother born Iowa. I have been unable to locate him in any 1910 census. 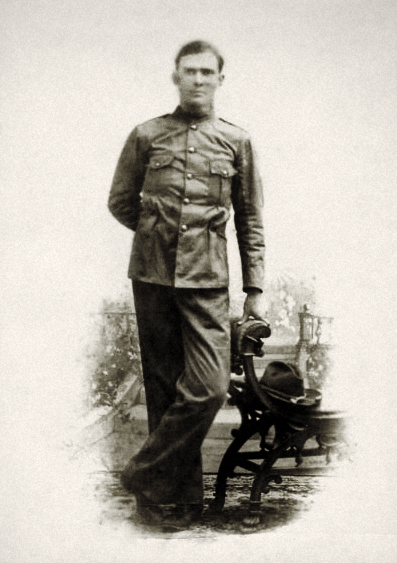 1920 shows him in an army hospital. A newspaper article later gives him as a Major but here he is listed as a mechanic. Eli moved about 1920 to Vicksburg, Warren, Mississippi, where he is observed married and with a young family in 1930. One son is named for himself and the other is named for his father. Eli Wilson McKenney Jr., according to public records, was born 1922 March 6 in Mississippi, served in the Navy during WWII, died 2005 Jan 26 at Corpus Christi, Nueces, Texas, and is buried at the Ft. Sam Houston National Cemetery in San Antonio, Bexar, Texas in Section 35, Site 1. His wife was a Catherine Lois Brannan. A 1937 news article recorded George W. McKenney Jr. visiting with his half-brother. This is based on a small newspaper article (see below) noting a visit from his “brother” G.W.jr. This visit, I believe, was made in 1937. “Major and Mrs. Eli W. McKenny, of the Culkin neighborhood, are Expecting a visit from Major McKenny’s brother George McKenny Former mayor of Chataqua, Kansas, and his wife and son, of Sedair, Kans., who will arrive here next week. They are traveling by auto. Eli Sr. was still alive in 1952 when his sister, Addie, died and is mentioned in her obituary. My hope is that descendants will hit upon this page and contact me with further information on Eli and his line. I have no photos of Eli and it would be nice to have one. Are you a descendant? Don’t hesitate. Contact me! Would love to hear from you. A photo of Eli with his older half-brother George W. McKenney Jr. and his older half-sister Addie McKenney McWhirt can be seen here. I think it was taken in the early to mid 1940s. Eli was also married to a woman in the Philippines. They had children: Julia, William and Lucila. Please, if you have info on non-living individuals in these lines and perhaps even photos you would care to share, contact me. I found this at Genforum on researching veterans of the Spanish-American War. “Our National Archives and Records Administration (NARA) had a fire in 1973 that burned about 80% of Army service mens records from about the Span War to early 1960’s.” As I was interested in researching Eli in the Spanish-American war, I was glad to see that the person who had supplied this information referred another researcher to Ancestry records for the Civil War Pension Index: General Index to Pension Files, 1861-1934. This includes the Spanish American War. Thus I found Eli’s pension application. The date is 1938 Oct 19 and is made from Mississippi. He’s listed as having been in the 32nd infantry, which we knew, as well as the 14th, which I hadn’t known about. The researcher at Genforum also said to look at the “U.S. Returns from Regular Army Infantry Regiments, 1821-1916 Record for Edwin C. McNeil”. The “U.S. 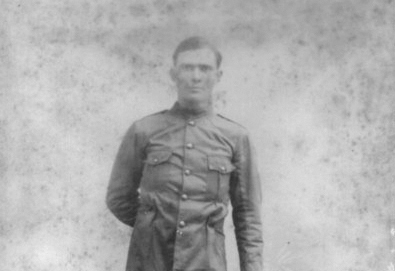 Returns from Regular Army Infantry Regiments, 1821-1916 Record for Edwin C. McNeil”, gives in the 14th Infantry, 1911-1916 Eli W. McKenney who was a private. Company L. So this matches with our Eli’s pension application. The date for this return is September 1914 and it looks like they were in the states of Washington and Alaska and Fort Missoula Montana by then. Company L, Eli’s company, seems to be shown as being in Ft. Missoula Montana in 1914. 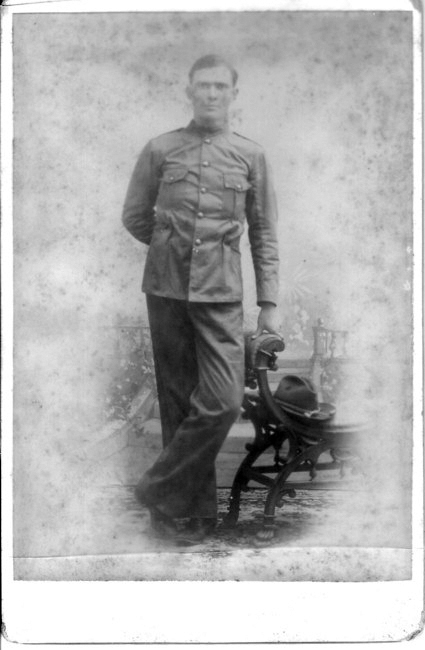 I have no idea when Eli entered Company L of the 14th infantry but a brief online history of the 14th gives them as being in the Philippines during the Spanish-American war, then in 1901, then in 1903-1905, then from 1906-1910. Our Eli W. McKenney is the only Eli McKenney who appears in these returns. They don’t have returns for the 32nd Infantry so I am guessing they were probably destroyed in the fire of 1973. Eli had three children in the Philippines: Julia, William and Lucila. 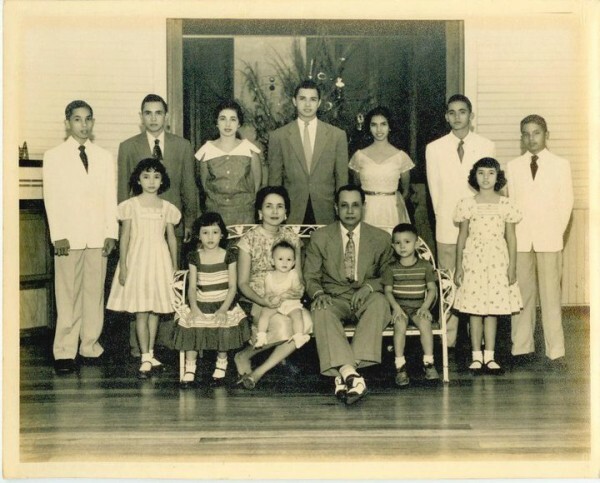 I’ve received from Maria Seifred the below wonderful photo of the family of Eli’s daughter, Lucila McKenney Pijuan, who had twelve children. Eli married a filipina. His children were Julia, William and Lucila. Lucila was my grandmother, and she bore 12 children . His last name was spelled Mckinney…. Maria, thanks so much for commenting. Eli was the half-brother of my ancestor, George W. McKenney Jr. The name spelling on the last name fluctuated. The father of Eli was often given as George W. McKinney but George W. McKenney was what was finally entered on his tombstone and the George W. McKenney Jr. line used McKenney. If you have information you want to send me on your family that you want me to enter into my database, please do so. And if you have more specific information on Eli’s wife and children you would like for me to enter in this post on him, please let know on that as well. I’d be glad to put it up. Lucila had 12 children, one of whom is Aurora. Not sure which one she is in the photo, maybe one of the younger ones. 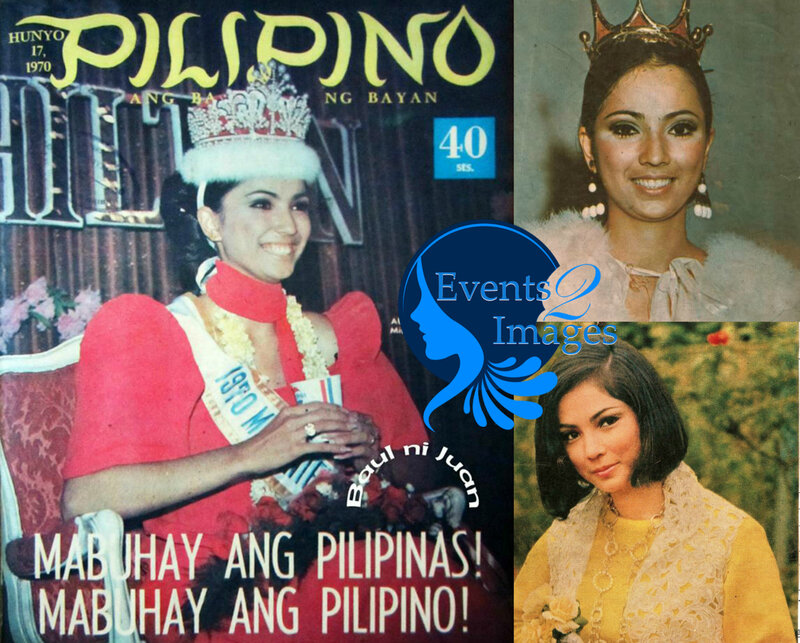 Growing up in the 1970s in the Philippines (me), Aurora was a well known young lady because she won the Miss International title in 1970. Thank you for linking the photos. A beautiful woman.